The Safety Centre can supply the C-Tec CFP702-4 Fire Alarm Control Panel. This panel is part of the C-Tec CFP fire panel range and features 2 detection circuits. The C-Tec CFP702-4 is ideal for small fire alarm system installations and is both EN54 and BS5839 compliant. For more information on this product call us NOW on 01200 428 410. 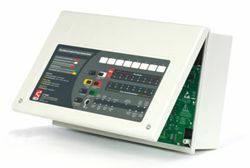 In addition to the C-Tec CFP702-4 we can also supply the 4 and 8 zone versions of this control panel. The Safety Centre can also offer a starter kit using the CFP702-4 as the basis. This kit comes supplied with 4 No. Detectors and Bases (3 No. smoke & 1 No. heat), 2 No. Call Points, 2 No. Sounders and 2 No. Standby power battieries. This is an ideal starter pack for small fire alarm system installations and can easily be added to should a larger system be required. We offer a free UK mainland delivery service on this kit, which again makes it extremely cost effective. If you’re interested in the C-Tec CFP702-4 panel you may also be interested in our Emergency Lighting Batteries and Wireless Fire Alarm ranges.